Enermax presents a wireless edition of the Aurora Lite. The new Aurora Lite Wireless uses 2.4GHz RF wireless technology and promises an operating range of up to 10 meters (30 feet). 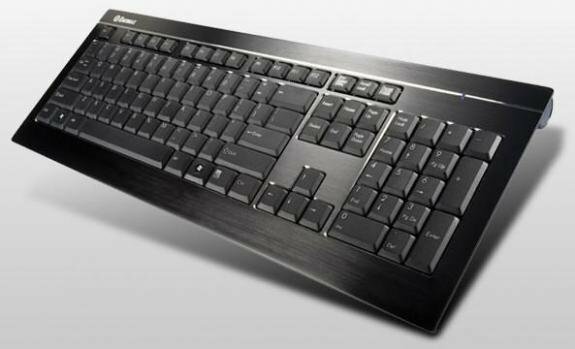 The keyboard has a brushed aluminium enclosure, flat key caps, and Scissor key switches with a lifetime of 10 million keystrokes. A cover cloth is included in the package to protect the keyboard against scratches and dust. Power is delivered by two AAA batteries, there's a power saving mode and the USB receiver is "nano" sized. The Aurora Lite Wireless measures 460mm x 160mm x 9.2mm (L x W x H) and weighs 895g. Pricing in retail stores should be around 59.90EUR, and you can choose between a black or silver edition.